Summary: 2013 Thanksgiving Day is coming soon, Pavtube is offering Thanksgiving Day 2013 Sale for Your mom! Check out our Freebies, Buy One Get One Free Gift and Up to 66% off discount before Dec.10, 2013. Thanksgiving Day is a welcome holiday especially in the business world. Many people still haven’t had a vacation since Labor Day, and the thought of returning home to friends, family and native food is blissful. Before hurriedly stuffing your suitcases to enjoy a care-free weekend, just double check whether you already take the benefits from our discounted products for your Thanksgiving Holiday! 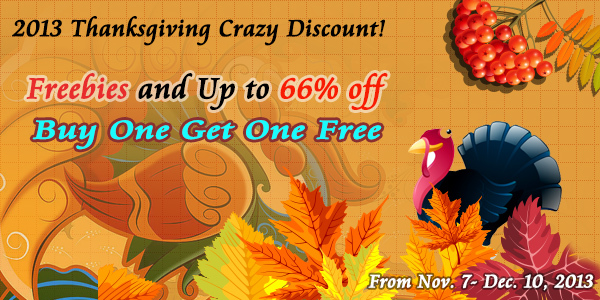 In this upcoming Thanksgiving Day Holiday, Pavtube will offer up to 66% discount for most of the product lines, some products are even free. Recent upgraded products are also included in this Thanksgiving treat as below. More surprisingly, additional 20% discount will be easily got by sharing and #Pavtubethanks2013 on your Facebook for our treat. All the desired audio and subs tracks can be retained in the output file .mkv/.mp4/.mov. for Pavtube ByteCopy, with less than 10 minutes’ conversion speed under lossless MKV format for an 4GB movie, and you can switch on/off audio and subtitles at will during movies. -Import and export MXF with selectable multiple audio tracks,and mix MXF desired audio tracks into one. It is apparently for MXF MultiMixer and iMixMXF. It is very helpful when there is a scene which several sound tracks from different persons, and you want to delete some sound tracks or mix them into one. It enables users to go directly to the exact chapter they want to watch, and no longer need to fast forward or rewind slowly and blindly. This function is applied to Pavtube ByteCopy, MXF MultiMixer and iMixMXF. This function is optimized with more specific 3D types. Side by side(left/right), top-bottom and anaglyph(red/blue) effect are all available. It applied to Pavtube ByteCopy, Blu-ray Ripper for Win/Mac, MXF MultiMixer/iMixer for Mac, MTS/M2TS Converter for Win/Mac, Video Converter Ultimate/iMedia Converter for Mac. Users are free to preset specific 3D types if they want output videos to be played on 3D player. Output format is .mkv/.mp4/.mov/.wmv/.avi. If you are a 3D fans with limited budget at the moment it would be crazy if to afford such a big expense to buy 3D version movie for all of your favorite movies, some may be even not available now. Then some of our related products , like Pavtube ByteCopy, Blu-ray Ripper and Video Converter Ultimate can meet your need so that you can enjoy 3D movies on Epson Powerlite 835p video projector, Samsung 3D TV etc. -Preserve high quality for your HD Media Player. Additional output format of HD media Player for Pavtube ByteCopy enables users to get lossless MKV output for Seagate FreeAgent Theater+, Netgear NeoTV/LaCinema Classic HD, WD TV Live/Live Plus/Live Hub, Popcorn Hour C-200/A-200/A-210 etc. , and can also get Optimized full HD MKV output for Iomega ScreenPlay MX HD Media Player as well as optimized AVI video for HDTV. -Compress and convert files to mainstream portable devices and editing programs. Our output formats include all of mainstream portable devices and editing program , such as Apple iPad Air, iPad Mini 2, iPhone 5S/SC, Kindle Fire HDX, Surface 2, Surface Pro 2, Samsung Galaxy Note 3, Galaxy Tab 3, Sony Xperia Z1, Google new Nexus 7, Final Cut Pro, iMovie, FCE, Adobe Premiere Pro, Avid Media Composer, Sony Vegas, Pinnacle, Windows Movie Maker, etc. Adobe Premiere can edit natively with MTS files, but it doesn’t work well at all if you do this. And FCP couldn’t transcode if the original directory structure from the camera is destroyed. Pavtube related products, like Pavtube MTS Converter for Mac, help convert such MTS files to ProRes for FCP to edit, and the files with high framerate can also be handled, like MXF 60p files etc. http://www.pavtube.com/thanksgiving-giveaway-2013.html for complete Thanksgiving discounted products. Founded in the year of 2007, Pavtube is relatively young but it never lacks passion and creativity as well as hard working. They create expert multimedia software applications that help consumers simply access, transfer and share their digital contents across different devices that range from PC, Mac, tablets, smartphones, to HD media players, game consoles, and home theaters.